The Club agreed to assist, and made an initial donation to start this “New Shed” project in February 2018. Rotarian Tom Quirk’s offer to undertake the task of co-ordinating the ongoing fundraising effort, and liaising with Fairbridge (inc) and the shed supplier (Anderson Sheds) was accepted. It is a credit to Tom’s tenacity that this project has progressed to the point where the outcome is assured. Many generous organisations in the local community have supported the project with donations of cash, or “in kind”. The donors include: The Rotary Clubs of Pinjarra and Harvey, Mandurah Mayday Club (Inc), Alcoa and Shire of Murray Combined Community Fund, MZI Resources, Bendigo Community Bank of Pinjarra, Pinjarra Junction Shopping Centre, Anderson Sheds, BGC Concrete and the Australian Government (via Andrew Hastie MP – Stronger Communities Program). Fairbridge (Inc) will contribute “in-kind” support with its VET (Vocational Education Training) construction students and tutors undertaking the site preparation works and building erection stages of the project, being a big “win-win” for everyone associated with the new shed. Hamish McArtney, a registered builder and member of the Rotary Club of Pinjarra, will be assisting Fairbridge (Inc) in an invited on-site advisory role during the building of the shed. The total cost of the new shed project is estimated to be $20,000. The Club now anticipates that the facility will be built and ready for use before winter 2019. The new shed will provide the more reliable, larger storage space required to hold bicycles (major use) and other exercise equipment (minor use) for the use of the Fairbridge Students. Funds are not being sought as a contribution to the cost of the bicycles and equipment that are stored in the shed. Independent Fairbridge College was started in 2016, with 30 students. Enrolments increased to 54 in 2018 and it is anticipated that student numbers will increase to 85 in 2019. It is believed that a much greater number will be enrolled in 2020, due to more regional schools referring students to Independent Fairbridge College. There are considerable benefits to the enrolled students (TAFE and high school level), and visiting students, (all aged from 12 to 24 years) who participate in the outdoor physical programs that are available at Independent Fairbridge College. These programs, (that include team building, leadership development), have lead to high classroom attendance and engagement rates of disadvantaged and disabled students participating in the combined indoor academic and outdoor physical activity programs. The general community then benefits from the greater workplace participation by Fairbridge students after they graduate. 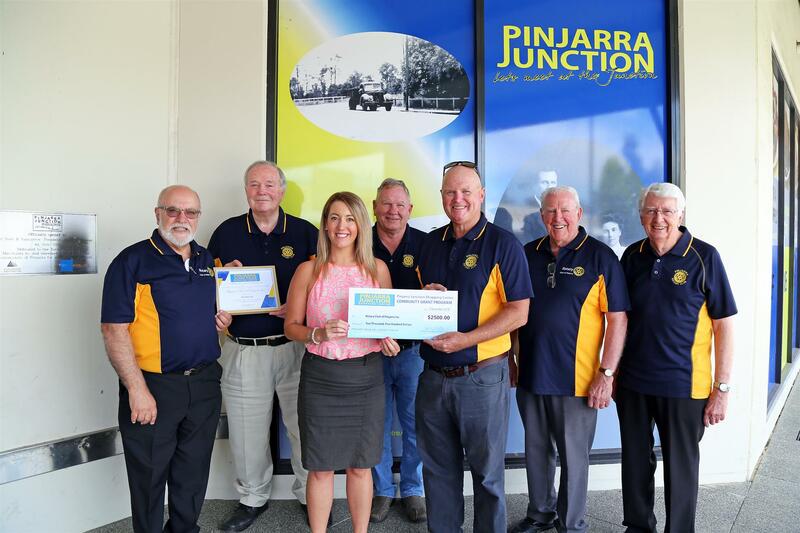 The most recent donation that has been received, supporting this project, was made by the Pinjarra Junction Shopping Centre, when the formal presentation of a community grant ($2500) cheque, from the Pinjarra Junction Shopping Centre to the Pinjarra Rotary Club, took place on 8th January 2019. The presentation was made on behalf of the Pinjarra Junction Shopping Centre by Linda Smith, the Centre’s Marketing Coordinator. 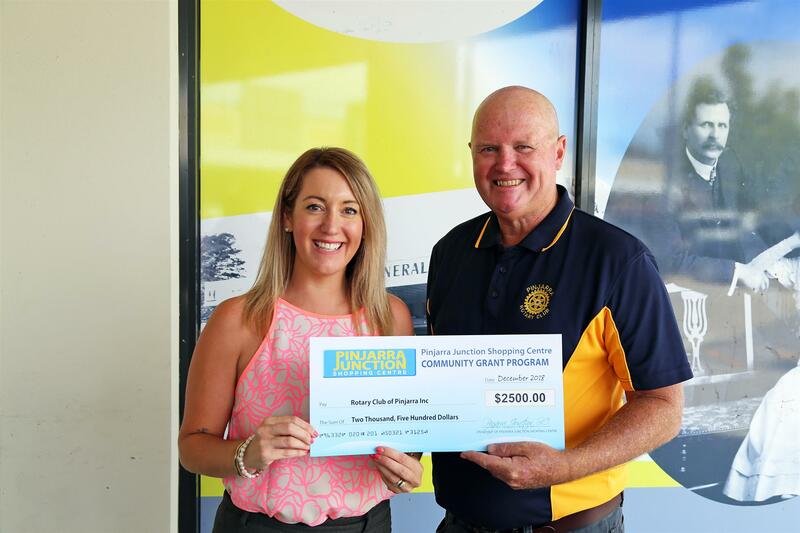 Jade Creevey (Fairbridge) and Geoff Booth (President, Rotary Club of Pinjarra), with the donation cheque presented by Linda Smith, the Marketing Coordinator for the Pinjarra Junction Shopping Centre. Members of Pinjarra Rotary Club (Left to right) are Vince Costantino, Tom Quirk, Don Marshall, Geoff Booth (Club President), Don McClements and John Smith, are pictured with Ms Jade Creevey, the Hospitality and Development Manager at Fairbridge (Inc).